VMworld 2014 couldn’t have started better for VMware than as it did now. Days before the event opens they announce that the acquired Cloudvolumes. This is their second huge announcement after acquiring Airwatch earlier this year. We heard rumors that something was being acquired but I have to be honest I never expected it to be Cloudvolumes. So we’re all thrilled and all but let’s put our feet on the ground and take a look what Cloudvolumes offers and if it will rock the EUC world. 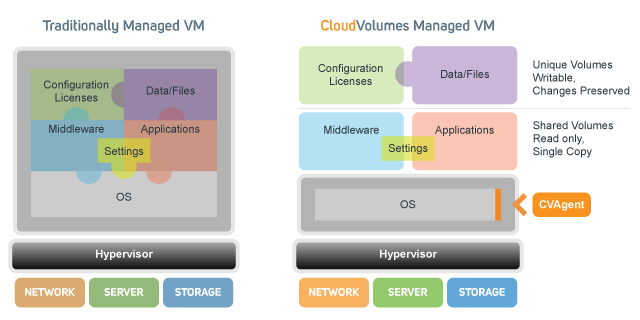 Cloudvolumes started only a few years ago, uses a layering technique to apply (not deploy) applications to virtual machines just in time when they are required. This might sound a bit spooky but let me explain what I mean. 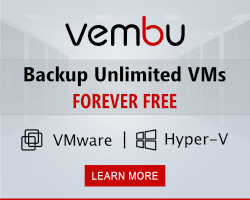 In a classical virtual environment you have numbers of virtual machines and each virtual machine has some applications installed, these applications are installed per virtual machine. Management of these applications has to be done per virtual machine. This is a tedious job and it takes time, disallowing users to use the virtual machine. What Cloudvolumes does is detach this application from the virtual machine and apply a layer with the application to the machine just in time when the user logs on. This is done by giving vCenter the command to attach the VMDK to the virtual machine. The application will be present as soon as the user has a desktop and start menu. The application is the same and will react the same, it’s just not installed in the virtual machine anymore. The drawing here (taken from the Cloudvolumes site) shows in a very simple way how Cloudvolumes work. A small agent in the virtual machine is waiting until the machine starts or stops, it waits for the user to log on or log off and if one of those actions occur it will send out a signal to the Cloudvolumes manager. The manager will search it’s database to see if this virtual machine with this user needs a certain VMDK. When if finds a need, it will send out a command to vCenter, it will not take any action itself concerning attaching VMDK’s. Is it only for desktops? First thing you might think of is that Cloudvolumes is only for desktops, that they bought it to expand the VMware View scope. I’m sure that will be the main area of interest for Cloudvolumes for if they integrate this the right way into VMware View they have a killer solution on their hand. Back to the question, no it’s not only for desktops, it works the same for desktops as it does for servers. So example, you have a web shop and during a certain time of the year let’s say Christmas more user visit you web shop than usual. Because you don’t know how many visitors you will get it’s hard to make sure you have enough resources available. Also just powering on 100 servers to be sure might cost to much when there are no customers. You need a smart system to add more resources when needed. VMware has something like that already but that is built around a classical virtual machine with applications installed already ready to be started. What if we think a bit out of the box, like a clean server with nothing installed ready to be started. Think about the layering we just talked about with the desktop, that we apply a layer just in time when the user logs on? What if we did something similar with a server, so deploy a server when resources are getting low and just in time apply a layer with IIS and dependencies to be used for your web shop. That would mean that the server you use is a common server and after it’s web shop task the layer will be detached to make it common again without having to install any application. Benefits? faster deployment and less management. The heading says it all, couldn’t think of a better one..
Cloudvolumes is not a layer in between you storage or so, it’s a broker that will tell vCenter to add or remove a layer to a virtual machine. The layers can be stored on any kind of storage so there are no limits there and as written before it’s not inline of the storage path, it’s a kind of broker. One thing we have been seeing a lot last years are vendor trying to solve the “my user want to install application and we have a non-persistent VDI desktop” issue. With Cloudvolumes you can attach a write-able layer to a virtual machine allowing just that, users can install applications, change settings and these applications and setting won’t be lost. The virtual machine as mentioned before is just a virtual machine, it has no relationship with the layer and therefore the layer can be attached to any virtual machine. The user will be able to use the applications and settings anywhere. It makes a non-persistent virtual machine feel and look like a persistent virtual machine. What will VMware do with Cloudvolumes? What we see with most companies acquired, not just with VMware but globally is that the expertise and valuable parts are stripped and slowly integrated in the product line. I’ve never worked with Cloudvolumes so I can’t tell you how well it works with a VMware view environment. If it integrates fine as it is, perhaps a rebranding is all it takes, a rebranding and integration in the console would be my first thought. Cloudvolumes also supports Citrix XenDesktop, Dell vWorkspace as a broker, not sure if they both survive. May this year I was at a VMware partner meeting in the UK and we discussed management of the RDS servers for that was something VMware lacked. Being a long time Citrix consultant I knew about the pitfalls of not managing a SBC environment, the servers get dirty and users will experience issues. While VMware now had the option to deploy VDI, RDS and published applications they lacked to option to provision a RDS server. We thought that they would improve Mirage to take that place but also Composer was mentioned. Now with the acquiring of Cloudvolumes they have a management solution for the RDS hosts. With Cloudvolumes you could add a write-able volume to the RDS host for users to work in and detach it after they log off, making sure the RDS host stays clean. Well that will be a nice topic at VMworld this year, lets see if I registered for the right sessions? I think I covered the basics, more is to come after I visited VMworld. Watch out for me at VMworld, I’m the guy with the Citrix bag. I think Cloudvolumes is an interesting acquirement for VMware, I hope they will integrate it correctly. I’ll get back to you with more info when I got some, see you in SanFran.